They may have been delayed but in just a few days time Royal Mail will unleash a set of commemorative stamps celebrating two hundred years of prehistoric animal studies in the United Kingdom. Ten first class stamps are being introduced on Thursday October 10th featuring Mesozoic creatures whose fossilised remains are associated with strata found within the UK. The stamps which showcase the artwork of that renowned palaeo-artist John Sibbick have been designed to show some of the animals “breaking out” from their self adhesive stamp frames. The stamps have been produced under the guidance of palaeontologists from the Natural History Museum, including the wonderful Angela Milner, Dr. Milner, along with Alan Charig, her colleague at the Natural History Museum (London), named and described Baryonyx, one of the dinosaurs featured in the set. The list of extinct animals portrayed is as follows: Baryonyx, Polacanthus, Iguanodon, Cetiosaurus, Megalosaurus and Hypsilophodon. These six are dinosaurs, the other four remaining stamps feature reptiles but certainly not members of the Dinosauria. There are two marine reptiles Ichthyosaurus and the long-necked Plesiosaurus. There are also two Pterosaurs (flying reptiles) depicted, Dimorphodon and the much later and larger Ornithocheirus. 19th and 20th Century academics and scientists based in the United Kingdom have made significant contributions to the nascent branches of the Earth sciences now known as palaeontology and geology. 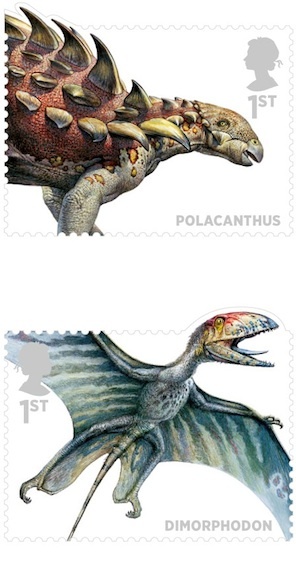 We at Everything Dinosaur are delighted to see such wonderful extinct animals such as the armoured Polacanthus and the mighty long-necked Cetiosaurus featured on a set of stamps. dinosaurs featured in stamp set. However, we do take issue with some of the inaccuracies regarding the prehistoric animals featured that have been included in various press releases and web sites from Royal Mail. 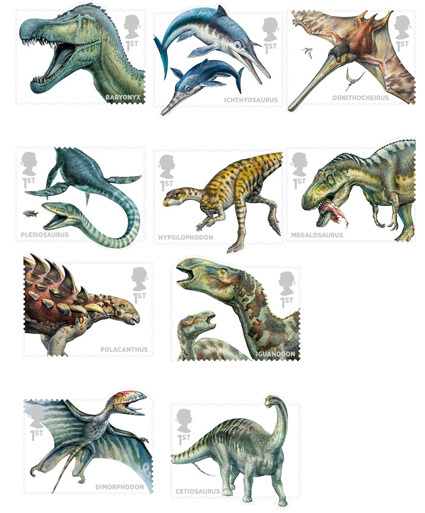 We at Everything Dinosaur, have pointed out that it is not appropriate to call this stamp set “British Dinosaurs”. 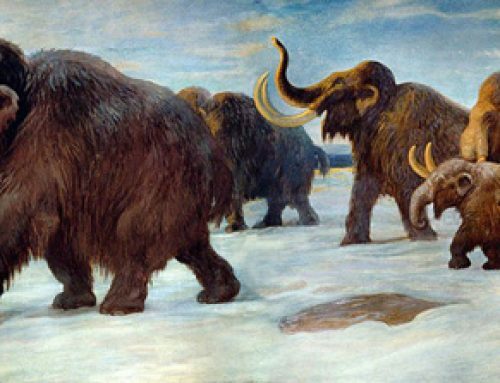 It could be argued that a number of the animals featured are associated with fossil remains found elsewhere within Europe as well as the United Kingdom, but our main bugbear lies in the fact that 40% of the set are not actually dinosaurs. Yet these stamps are being constantly referred to as “British Dinosaurs” or “Dinosaur Stamps”, these titles are inaccurate. The stamp set was originally scheduled for release last year, to mark the centenary of the publication of “The Lost World”, a novel by Sir Arthur Conan Doyle that tells the story of an exhibition to South America led by Professor Challenger that discovers a whole host of prehistoric animals surviving on a remote plateau. Ironically, a number of animals featured on the stamps such as the Iguanodon along with the Pterosaur Dimorphodon and the marine reptiles are featured in this book. British prehistoric animals beautifully illustrated. The South American Spinosaurid Irritator, a dinosaur from the same branch of the Theropoda family tree as Baryonyx has a link to Sir Arthur Conan Doyle’s novel. The specific name for Irritator (Irritator challengeri) is a reference to Professor Challenger, the central character in the book. Some of the information that accompanies images of these ten stamps that we have viewed on various websites and other media, including those under the domain of Royal Mail contain other factual errors. For example, in the information surrounding the Baryonyx stamp it is claimed that this animals was named and scientifically described in 1987, however, we at Everything Dinosaur have always believed that this dinosaur was named and described a year earlier. New stamps celebrate prehistoric animals. The final pair of stamps we are going to illustrate on this blog posting features the fearsome carnivore Megalosaurus and the Early Cretaceous Pterosaur called Ornithocheirus. All these stamps will be available later on this week along with souvenir collectors packs, a wall chart and other items marking our continuing fascination with all things prehistoric. These stamps are worth collecting not least because of Mr Sibbick’s beautiful artwork. Interesting development and anticipated as set of Chinese stamps ! Will this influence CollectA’s decisions on which British dinos to manufacture ? A number of British prehistoric animals have been proposed to Collecta, we are keen to continue the theme of adding more replicas in both the Deluxe series and the not to scale series which represent British prehistoric animals, or at least those associated with UK strata. Ichthyosaurus has been proposed, the three models we have announced so far Carcharodontosaurus, Ichthyovenator and the dead Stegosaurus, these are scheduled for production in the next few weeks. There are plans to finish these models in late December for shipping in January 2014. Other models are currently under development with a view to releasing later in 2014, they are still in prototype stage and for the moment we can’t release further details. I am sure you understand, however, rest assured as soon as plans are finalised our blog and our Facebook page will be the first to announce details etc. Thanks for very detailed and interesting description ! It was my pleasure to read your article. I just wonder why Royal Mail is never commemorate UK’s greatest paleontologists such as Sir Rchard Owen or Mary Anning on their stamps ? Good point, we recall some stamps of Sir Richard Owen being issued in 1991, Darwin of course had stamps issued in 2009, but we can’t remember any stamps about Mary Anning, perhaps it is long overdue. Other prime candidates would surely be Alfred Russel Wallace and Adam Segewick ? Yes, absolutely, we are planning a short blog article on Alfred Russel Wallace for publication on November 7th. I have a question about that: Is Milner still with the NHM &, if so, in what role? As a collecter of animal stamps: it is amazing set! But can it be bought? Or stumbled upon on collections on Ebay? I live here, but haven’t see it. It was on general sale last year at Royal Mail, so it should be generally available through the usual stamp collecting channels. Angela is a very busy lady, one that we have difficulty keeping up with at the best of times. The stamps project was started some time ago and Angela we think has now officially retired from the Natural History Museum (she started work there back in 1976). Her last post was Associate Keeper of the Department of Palaeontology (we think). Thanks for your input.